I'd delighted to plug this which is taught by many good people known to Traditional Catholics in England and on the internet, including Prior Cassian Folsom of Norcia's benedictine community, Fr Thomas Crean OP, and Prof Peter Kwasniewski. Most bibles today coyly refer to 'The Letter to the Hebrews', whereas the liturgy (at least in the EF) introduces readings from it as 'St Paul's Letter to the Hebrews'. It is at any rate part of the Pauline corpus, and arguments against Paul's authorship based on differences of style and theme should be taken with a pinch of salt: the same arguments would suggest that Henry VI Part III could not have been written by the author of The Tempest. It is a hugely important part of the Scriptures, particularly in light of modern errors. Its very existence is a rebuke to the modernist argument that the sacrificial nature of the Mass was not emphasised until long after the Apostolic era, the 4th century or so. This promises to be a very interesting and edifying session, with a truly uplifting cultural, and above all liturgical, backdrop, in the lovely town of Norcia, the birthplace of St Benedict. "The Transcendent Christ: St. Paul's Letter to the Hebrews"
From July 10-24th, the St. Albert the Great Center for Scholastic Studies will hold a summer session in Norcia, Italy. In partnership with the Monastero San Benedetto, this will be the fifth year they have held the Summer Institute. Helmut Rückriegel, FIUV President d'honneur, R.I.P. One of the elder statesmen of the International Federation Una Voce (FIUV), Helmut Rückriegel, died early on 25th of January, 2016. A great champion of tradition over many decades, he was a man of urbanity and charm. I hope there will be a proper obituary of him in due course. In the meantime, please pray for him. His Funeral Mass will take place in Bonn on Friday 5th of February. 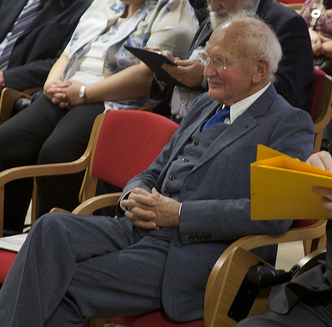 I took this photo of him at the FIUV General Assembly, in Rome, in 2013. Anyone who would like to reproduce it, please do so (though I expect there are better ones). thanks to the arrival of the Fraternity of St Peter. The Catholic Herald reported Mgr Charles Pope's slightly strange blog post about Traditional Catholics to which I had replied here. It picked out his comment that there was less pent-up demand for the EF today than there was in the early 1980s. I addressed this in a letter which they published last weekend. You report Mgr Charles Pope as warning that the popularity of the Traditional Mass may have 'reached its peak' (The best of the blogosphere, 15th Jan 2016). Mgr Pope observes that in the early 1980s, Traditional Masses were often packed to the doors, but that things are different now. This is perfectly true, and is not due only to the fact that fewer Masses were on offer back then. In 1980, under the brief editorship of Christopher Monckton, the Universe conducted a survey of Catholics which showed that half would attend the Traditional Mass, were it available. Today, only a small minority would know what you were talking about. 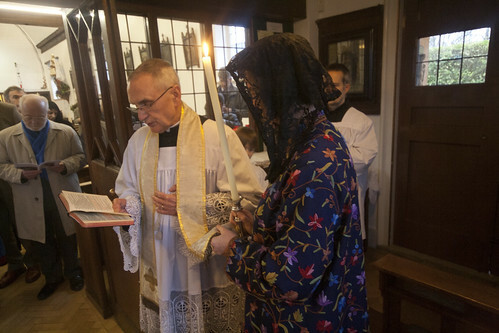 Today, promoting the Traditional Mass is no longer a question of telling people that the form of the Mass they remember from a few years ago, and loved, is being said somewhere. It is, rather, a question of encouraging people to try out Mass in a form they did not know existed. This means that Masses at peculiar and irregular times, is rotating venues, and on weekdays, are not going to grow. 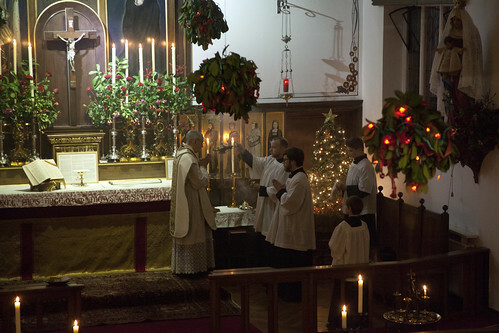 What we have seen again and again is that where the Extraordinary Form is offered every week on a Sunday morning, even in places with no previous demonstrable demand for it, it quickly attracts a growing congregation of young people and families, and can play an important part in conversions and vocations to the priesthood. 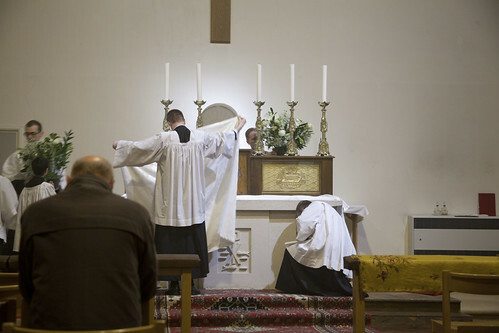 The Stripping of the Altars on Maundy Thursday, with the FSSP in Reading. 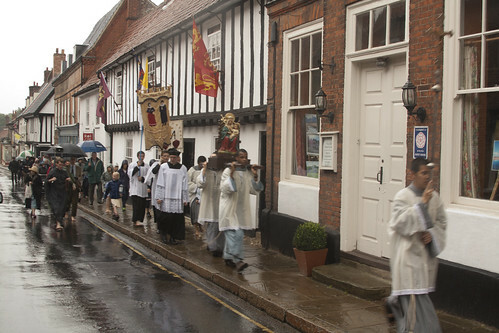 Until 1955, the Mandatum took place after this, final ceremony of the Mass of Maundy Thursday. I've been asked for a statement on the decree of the Congregation for Divine Worship allowing the washing of the feet of women as well as men in the 'mandatum' of Maundy Thursday. I feel very sorry for priests who have been trying to obey liturgical law on this issue, as on other issues in the Ordinary Form. They may well feel betrayed. Equally, I can see that from the Roman perspective, the rule has become meaningless - and did so even before the Holy Father broke it himself. This has happened again and again since Vatican II. The traditions of the Roman liturgy, as preserved in the Ordinary Form, are being stripped away one by one. An important aspect, which is generally neglected is the question of the etiquette of men washing the feet of women. This would have been considered inappropriate only a few decades ago in the West, and such a view persists in many cultures. In many developing countries there is serious conflict between people trying to be as progressive as possible on such matters, and others reasserting traditional sexual constraints and gender roles. This decree is not going to help priests in those places. 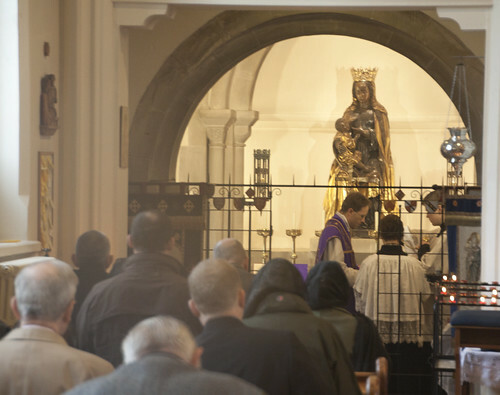 The annual Latin Mass Society Pilgrimage to Our Lady of Caversham will take place on Saturday 20th February, the Ember Saturday of Lent, 11:30am. 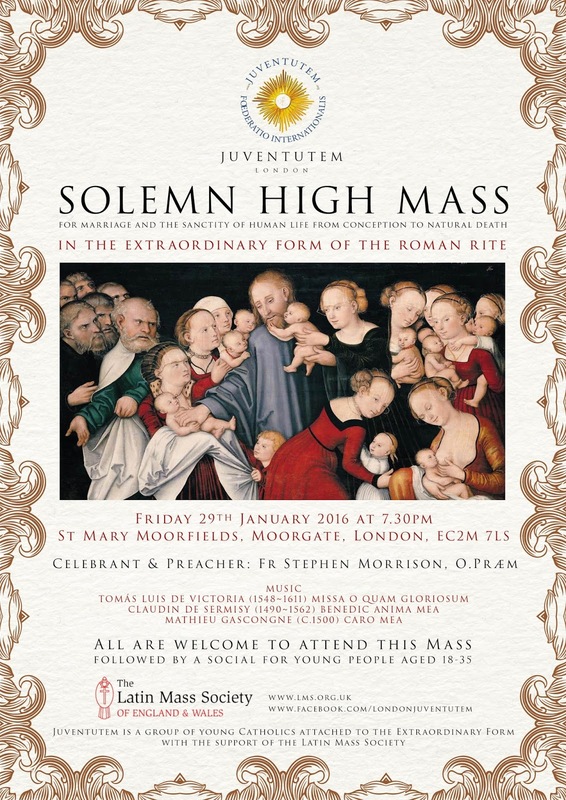 It will be a sung or high Mass. The celebrant will be Fr Anthony Conlon; Mass will be accompanied by the Schola Abelis (chant) and Cantus Magnus (polyphony). The church is located at 2 South View Avenue, Reading RG4 5AB:P click for a map. Silent "Year of Mercy" retreat for diocesan priests and religious, deacons and seminarians, led in English by Fr Armand de Malleray, FSSP on the theme: “Jesus Christ is the face of the Father’s mercy”. Wigratzbad is a Marian shrine in the diocese of Augsburg in Bavaria. It is also home to the Mother-house and International Seminary of the Priestly Fraternity of St Peter. In this refreshing rural and Catholic environment, 80 seminarians are training for the priesthood, including several Britons. We will have the opportunity of praying some of the Divine Office with them: a memorable experience. Every priest retreatant will be able to say Holy Mass in the Form of his choice (at the diocesan shrine church, or at the Seminary). There will be daily Eucharistic Adoration. Every morning and afternoon Fr de Malleray will give a meditation (in English). Meals are taken in silence with table readings for lunch and supper. The Shrine Cafeteria is accessible for mid-morning coffee/tea and afternoon snack. Every retreatant will have a single room with ensuite bathroom. The other day, Pope Francis visited a synagoge. Near the beginning of the video of the visit (below) an old Jewish man greeted the Pope and then says to him: "Senta, siccome Lei un grande ricostruttore, perché non mette "la circoncisione" un altra volta nel calendario come... quando ero ragazzino, è una buon'idea, non? Sarebbe per noi..."
"Look, since you're a great rebuilder, why not put The Circumcision once again into the calendar as it was when I was a little boy? It's a good idea, don't you think? It would be for us..."
The re-naming of the feast of 1st Jan is one of the odd and unsatisfactory things about the 1962 Calendar. Unsatisfactory, because the solution they came up with in 1962 - renaming the 'Circumcision', 'the Octave of Christmas', didn't satisfy the reformers only a few years later, when it was renamed 'the Feast of the Holy Mother of God'. It is the only one of the ten Days of Obligation listed in Canon law where the name is different in the 1962 Calendar and the 1970 one. Update: more info is posted below. Canon Montjean is open to the possibility of the coach picking people up en route, so it may not be necessary to get to New Brighton. The Institute of Christ the King, based in the Church of SS Peter & Paul and St Philomena in the Wirral, is organising an English contribution to a Lourdes Pilgrimage which will be visited by Cardinal Burke. I recently read in the Catholic press that the number of pilgrims to Lourdes has plumeted in the last few years. I don't know why, but it is time for Traditional Catholics to take up the slack. His Eminence, Cardinal Burke and all the Seminarians and Sisters of the ICKSP. I would like to organize the travel and acommodations from New Brighton, but I need a first estimate of the number of pilgrims. If you are any interested, please contact me before 25th January at 0797 212 8097 or chn.montjean@icrsp.org ! I'd delighted to post this on behalf of Robert Colquoun and 40 Days for Life. Abortion is the leading cause of death in the world, ending more lives than cardiovascular disease, cancer, AIDS, war, hunger … or any other cause (Based on data from the World Health Organization). The abortion crisis has reached epidemic levels across the world, destroying the lives of children and leaving women and men scarred with lives of regrets… every single day. WE cannot simply wait for politicians to solve this crisis. It’s up to us to “speak up for those who cannot speak for themselves” – right in our own communities. To help combat this crisis effectively, you’re invited to a one day workshop, sponsored by 40 Days for Life. The intensive event has been designed to help pro-life advocates develop skills, launch and expand effective life-saving projects, involve more people than ever before and save the maximum number of lives from abortion. During the hands-on workshop, you will be taught by leading pro-life experts. Each presenter will be speaking from their extensive live saving experience, and will reveal practical strategies you can immediately put into action to save more lives. 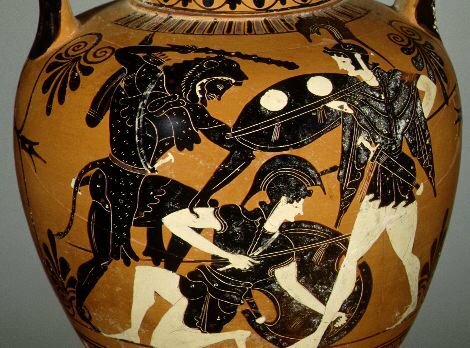 As I noted in my last post, a good number of people who regard themselves as upholding traditional, civilised values, have come to regard the cringing and self-hating subserviance of men demanded by many feminists as actually a moral imperative, under the title of 'chivalry'. 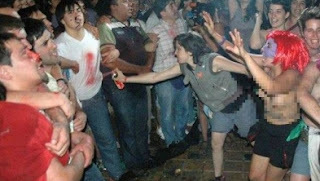 There was an excellent example last October from Argentina, when a huge mob of angry feminists attacked the Catholic Cathedral in the city of Mar de Plata. (They were angry with the Church as a whole for opposing abortion and the like.) The videos and photographs of this event were truly horrifying. The cathedral was defended by a chain of young men, using the technique of passive resistance. These men were verbally and sexually abused, sprayed with paint, punched and kicked. But the line didn't break, and the feminists weren't able to get into the Cathedral itself to desecrate it. 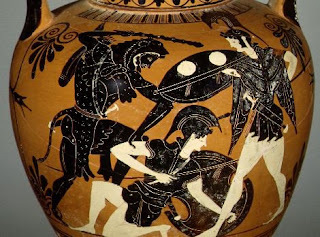 These young men were heroic; passive resistance can be a good technique, and in the circumstances I am sure it was the best approach. The point of this story for my purposes is the contrasting and craven attitude of the police. This is an annual event; they knew what was coming. Why did the police not intervene? Bishop Olmstead has reiterated his call to men to take their responsibilities properly, this time in a short but slickly produced YouTube video. I addressed his pastoral letter on the subject on this blog, here. The content of the video reflects Bishop Olmstead's letter. My comment on that was that it didn't get to the heart of the problem, which is that the reasons why earlier generations of men were hard-working, dependable, and willing to commit to marriage and children, have been systematically removed, to a large extent deliberately, in response to feminism. To tell men that they ought to 'man up' and marry and stay married when the marriage deal is no longer a rational choice, is unbalanced. It wasn't men who asked for these changes, and, interestingly, it is often women complaining about their consequences. The Church's intellectual leadership ought to be pressing these contradictions with a view to reversing some of the policies which make marriage unattractive, instead of, or at least as well as, lambasting men for failing to take leave of their senses to marry anyway. Indeed, the Church has actually made things worse, depriving men of the kind of liturgy which appeals to them, as I have discussed on this blog. Another ecclesiastical policy which is truly insane in the conditions of today is failing to discourage 'mixed' marriages - marriages of Catholics to non-Catholics. Another, of course, is the smoothing of the path to annulments. Today, the Church herself cannot escape blame for undermining the permanence of marriage. Not that I lay these failings at the feet of Bishop Olmstead, and I give him credit for addressing the problem at all. 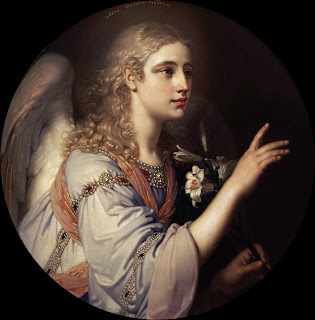 The video expresses the bishop's appeal by reference, at least implicitly, to the ideal of chivalry, and this raises another problem, because the concept of chivalry is often used in a very strange way. In video the suggestion appears to be simply that men put themselves on the line, take risks, for the sake of women (and children), without any thought of self. This sounds nice, but in reality it opens up generous souls to exploitation, and can look to women like the kind of 'putting them on a pedastal' which is unattractive and, quite reasonably, intensly annoying. If this is the take-home message, we are setting up young men for failure and unhappiness. 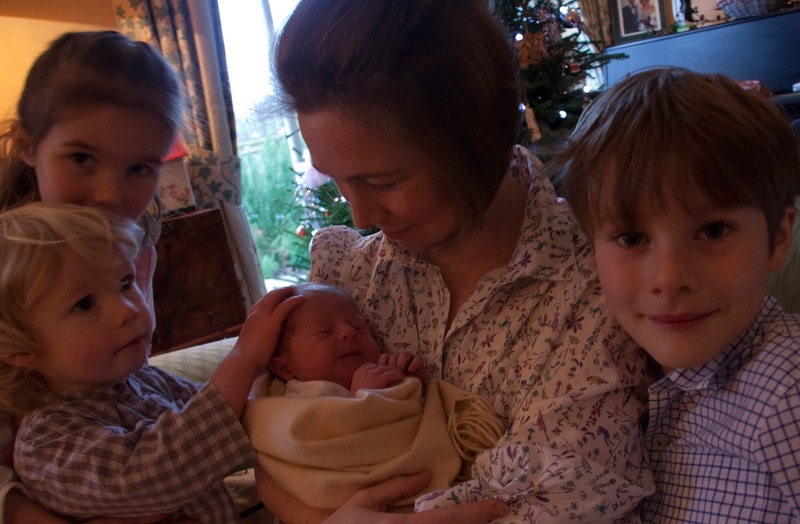 'Churching' is the blessing of a woman after childbirth. It is involves leading the new mother into the church, and many beautiful prayers of thanksgiving and blessings. No new mother should miss out on it. It will be High Mass with polyphony; the celebrant will be Fr Stephen Morrison O.Praem, the Chaplain of Juventutem London; he will be assisted by Fr Ian Verrier FSSP and Fr Cyril Law. As always the Mass is sponsored by the Latin Mass Society, and with the kind permission of Canon Peter Newby, the Parish Priest. These Masses are being arranged for every 'last Friday' of the calendar year, so if you can make St Mary Moorfields make a note of the dates. The postcode is EC2M 7LS (click for a map). Reply to Mgr Pope: Lazy Traditional Catholics? 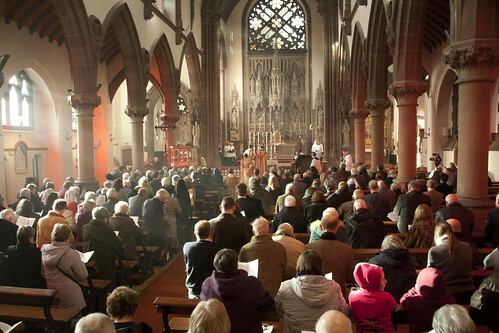 Mgr Charles Pope has written a blog post about how those who love the Traditional Mass should make greater efforts to evangelise for it. He says this because he thinks, on the basis of anecdotal evidence, that attendance at the EF has stopped growing. He links this with the very lethargic attitude he once noticed, of Novus Ordo Catholics faced with the prospect of losing their parochial school. I confess I don't understand the parallel. These Novus Ordo Catholics of a couple of decades ago, mostly older people (people, he says, with grown-up children and grandchildren), whom the young Fr Pope talked to about their school, were members of the first, or the beginnings of the second, generation of Catholics who failed to reproduce and failed to pass on the faith. They had typically been brought up in significantly larger families, been given systematic catechesis in the old style, and had been introduced to Catholic traditions of all kinds: grace before meals, daily prayers, dressing up for Sunday Mass, an expectation that Catholic boys and girls should marry other Catholics, and the Traditional Mass. Nearly all of them chucked it in, everything except going to Mass on Sundays. 'What I have received, I have not passed on': that was the motto of that generation. Sometimes with regret, sometimes with relief, sometimes with the fierce joy of the vandal. But by the end of their lives, there was very little left. Their children had mostly lapsed. About half of them had lapsed themselves. The young ones still turning up at church were sometimes clueless about the Faith. Catholics today don't even necessarily know that the Church teaches the Real Presence. Mgr Pope thinks that the Traditional Catholics of today are like them? 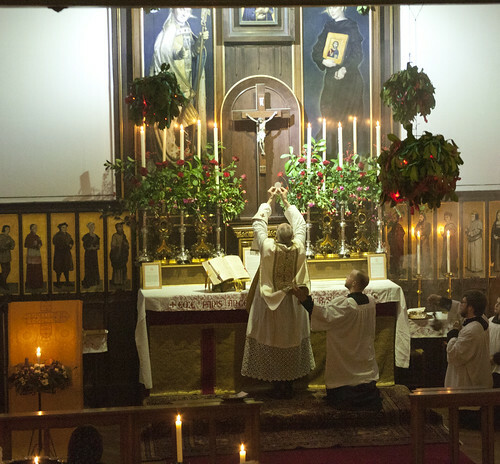 I thought I'd post some photos of the Sung Mass I attended for the feast of the Epiphany, one of the Holy Days it is the privilege of those attached to the Traditional Mass to attend on the proper dates. In terms of encouraging people to try the EF, and in generating controversty, the Bishops' 2009 decision to move the Epiphany, Ascension, and Corpus Christi to the nearest Sunday is truly the gift that keeps on giving. I read that the Bishops are reconsidering the matter. But then I heard that two years ago as well. We shall see. 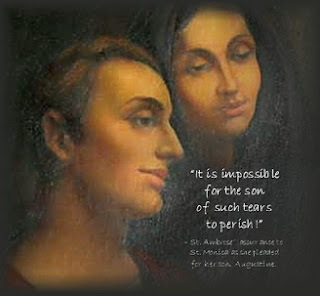 For the Year of Mercy, why not join the LMS 'Sodality of St Augustine' to pray for lapsed loved ones? Joining is free; the only obligation (not binding on pain of sin) is to say a short prayer each day, though you can do more (arrange Masses etc.). Members pray for each other's lapsed loved ones. I repost the details below, from its launch 18 months ago. Each year the LMS arranges a public Sung Mass for Sodality's intentions. A year ago the Latin Mass Society appointed, just for our 50th anniversary year, our first Publicist / Press Officer. We are extending the experiment with more hours, more money, and a somewhat tweaked job description. It will now be 10 hours a week, to manage the Society's flow of news through the dead-wood media, but above all on social media. The deadline for applications is 29th January 2016. It is envisaged that the job will be done mainly from home. See more details on our website here. I'm delighted to recommend this new book, partly a novel and partly a dialogue about the Church, the world, and Ireland. 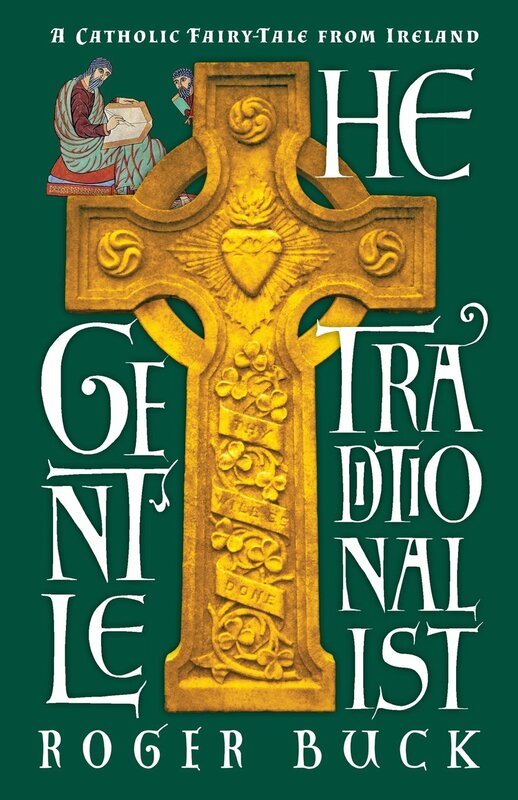 A whole heap of excellent books by traditionalists have appeared recently, addressing the crisis in the Church in the context of the crisis in the liturgy. The Gentle Traditionalist is different in addressing itself to non-believers. 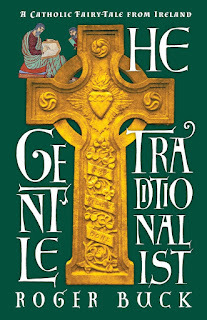 Thus, it does not primarily attempt to convince well-informed Catholic readers with detailed (or broad-sweeping) historical and theological argument; rather, it presents, in a charming but unflinching way, the Catholic traditionalist perspective on how things are, where we have come from, and what we can do about it. The detailed arguments of the other works are very necessary in winning arguments within the Church which need to be won, but this book may be more accessible, intellectually and emotionally, for many Catholics as well as for non-Catholics. It is witty and articulate, and will be balm for the soul for committed trads as well as food for thought for the unconvinced. I was allowed to read this book prior to publication, and some words of mine are on the back cover. a sample chapter can be read here. Francis Phillips reviews it for the Catholic Herald here. I suspect that this will be the case for a good number of Catholics with happy marriages. It doesn't necessarily mean that these marriages are actually invalid. Some might be, and the best response might be to make them valid, which should not be difficult to do. But the idea that the current legal procedures of the Church, coupled with the current practices in relation to marriage preparation, combine to mean that vast numbers of couples could walk away from their marriage vows, is vertiginous. If this isn't something that Bishops and priests should do something about, urgently, I don't know what is. Labels: Can the Church change Marriage? We have an addition to our family. Hector arrived on the evening of the last day of the year. If you are in Oxford, the Christening will take place in SS Gregory & Augustine's, in the Woodstock Road, at 3pm on Saturday 9th January.